More than 90 people attended a seminar on how to declutter, estate sales, move management and more. Lois Edmund of Seniors on the Move showing off an old book. St. Mary’s Villa for Independent and Retirement Living in Cherry Hill recently held a Downsizing panel discussion highlighting strategies on simplifying life through de-cluttering, estate sales, move management, realty planning and moving to some smaller residences. More than 90 people registered to garner tips and ways to get motivated in the difficult series of decisions to simplify. Pat Kalata of Holy Eucharist Church proposed the topic last summer to Ami Feller, Director of Community Relations with St. Mary’s. They partnered to produce an important series delivered by a team of experts and rallied the community to take note. One of the presenters, Barbara Berman of BB Clutter Solutions, posted the event and some of her following called to attend immediately. Berman said, “I have some loyal followers who like to hear as much information as they can on this topic.” She shared a formula called SPCA. It stands for rather “S” — sort items, “P” — purge meaning you can donate, give-away, do estate sales and ultimately keep stuff out of the landfill, “C” — containerize the items you use and need to keep and “A” — assign a home for each item. Jared Willmann of Byron Homes gave handy downsizing do’s and don’ts and advocated creating a floor plan to determine how the things you still need and use regularly will fit in the space you will reside and to avoid feelings of guilt. Many of the experts have spoken to some groups, but Lois Edmund of Seniors on the Move indicated most of the talks are with just a handful of people. 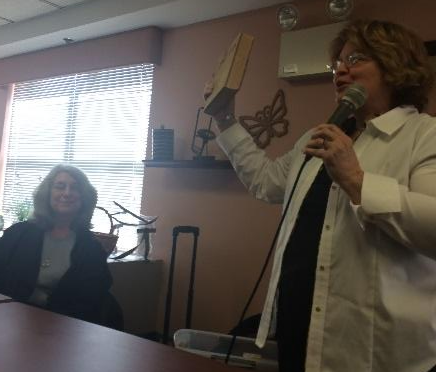 She excited this audience using her former home economics teacher tactics by holding up props like an old book to analyze with the group if it is worth selling as a true vintage item.